There seem to be a lot of these records this year - and by that I mean the kind that totally sneak up on you and totally change something in your head. When I first heard about this record, I was excited to say the least. 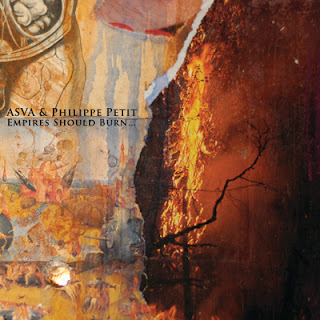 Considering that this is a collaborative effort between Asva's G. Stuart Dahlquist and self-trained composer Philippe Petit, it would be a serious chore to not be excited for an album of this magnitude and importance. When I received the album, I expected big things, but I did not expect to be blown away and changed the way I was. I should preface all this by saying that I'd become rather bored with a lot of experimental music over the past couple of years; the fault is my own - I simply did not put enough effort into exploring the various labels and artists that have been contributing a lot to experimental music. Outside of noise and power electronics, and a few labels that have been focusing on different forms of experimental music (Utech Records, Beta-Lactam Ring Records, and Denovali Records are a couple of the labels that I try to stay up-to-date with), I've not spent much time looking for new sounds. Whether I was looking or not, I found new sounds on this record. And it has really changed the way I listen to music. 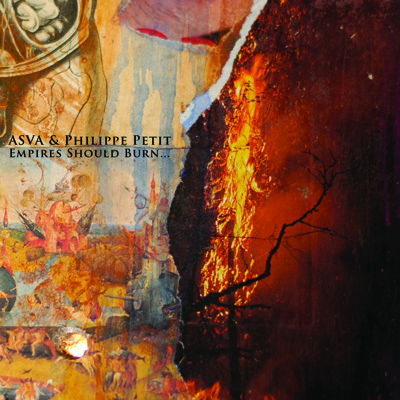 The first track, "And Empires Will Burn" takes up the entire A-side of this album, and from the very first second, the atmospheres created by the cacophonous textures of sound are just immense. You are given the impression immediately that these artists have something important to say, and unlike a lot of drone records, this one does not let your attention wander. You are hooked in, and suffice it to say you're not getting away - especially once Edward Ka-Spel's spoken vocals enter the fray. This whole album is great, but this track is very special indeed. It's probably one of my ten or so favorite tracks of the past 5 years, and it is responsible for the change I mentioned earlier. I can not listen to music now without hoping to hear something different every time I put the needle down. This tracks reveals something new every time I play it, and while I can honestly say that about the entire album, there is something about this track that keeps me coming back to it. The B-side features 4 more tracks, one of which features vocal contributions from Jarboe, and another with vocals by Bryan Lewis Saunders. It also contains the album closing "Apocryphatic Ally," which is the perfect closer for the album, with eerie piano strokes and something that sounds remarkably like a unborn baby's heartbeat from an ultrasound. I won't try to describe the sounds here any further. If that's a failure of mine, so be it. This is just another records that needs to be heard - repeatedly - to be appreciated for what it is. It has been released on CD and on heavy black vinyl by our friends at Small Doses and Basses Frequencies. You can get more information on the album from the links under the label's names, and then buy it, here or here.